How Can They Do That? DAY 152 – 02/09/2013 – POW! 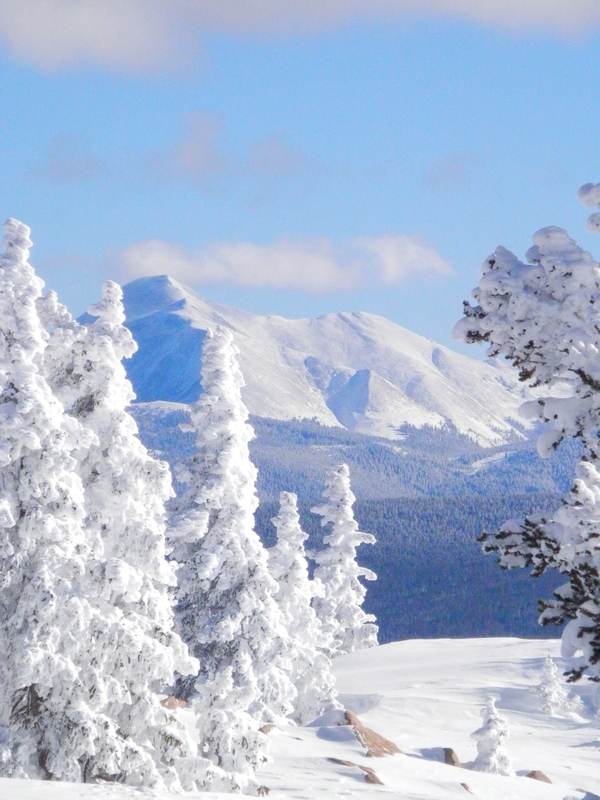 Every day here at Monarch Mountain in Colorado is actually pretty much the same. 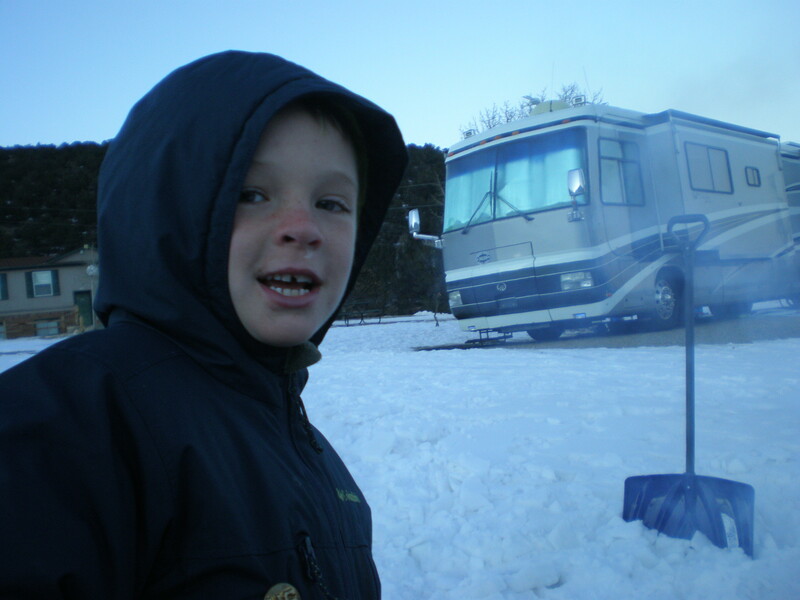 We wake up, putter around the Tramper for awhile, then go ski. After hours of fun in the snow, we come home, eat good food and go to sleep. That’s about it! Eat, ski, eat, sleep, repeat. How lucky can you get?! This life is idyllic. If I could transport myself through space and time to Maryland, in June, for just a few days a month to enjoy some gentle weather, life would be darn near perfect!! When we left for the mountain this morning, it was snowing! 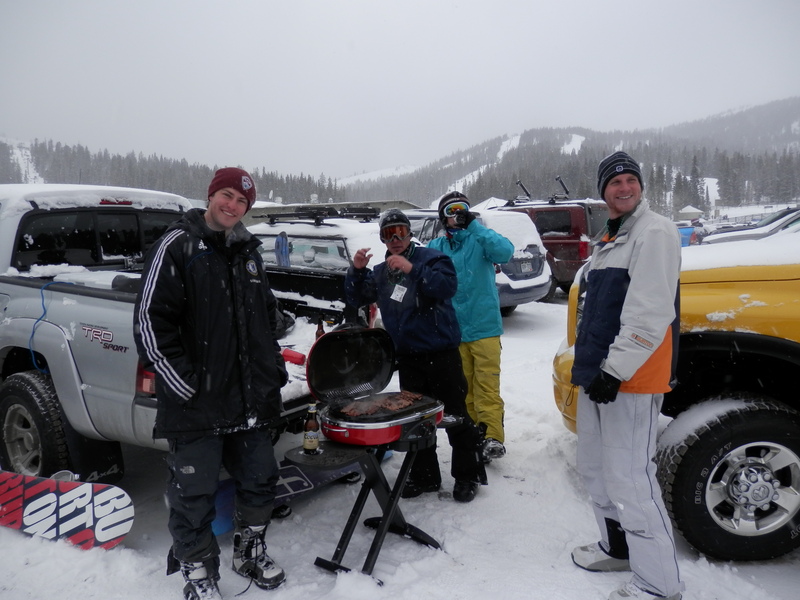 Everybody at a ski resort is so happy when it’s snowing! The lifties smile even more than usual, their badge readers pinging merrily as the skiers and boarders line up for some glee. The skiers and boarders are very happy. David and I sure are happy! Now, David and I obviously enjoy fresh snow. Skiing in powder is different from skiing on packed powder, which is how they describe snow that’s been around for a while. 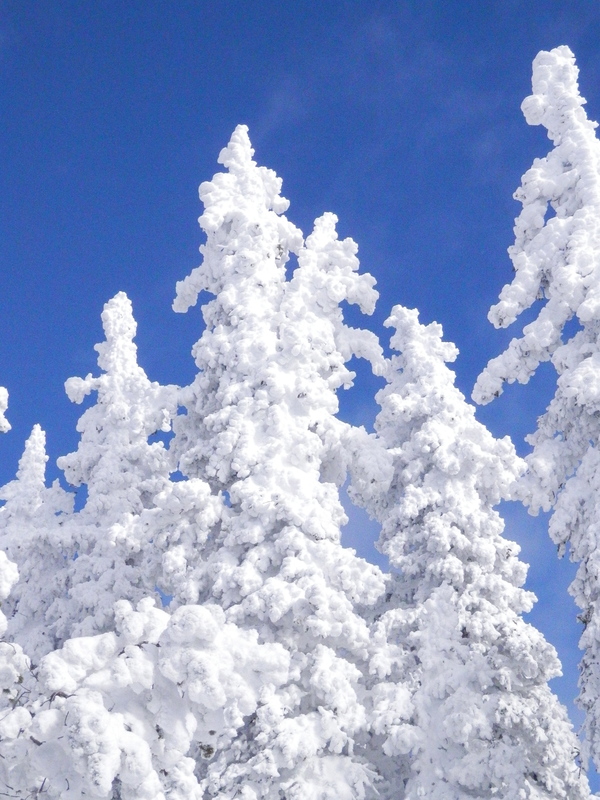 We love the fast, hard snow that makes you use the ski to power thrilling, fast runs. Big, arcing turns on hard snow feels like flying! It seems like snowboarders, except for the really good ones who can carve a turn, need fresh powder snow more than the average skier. 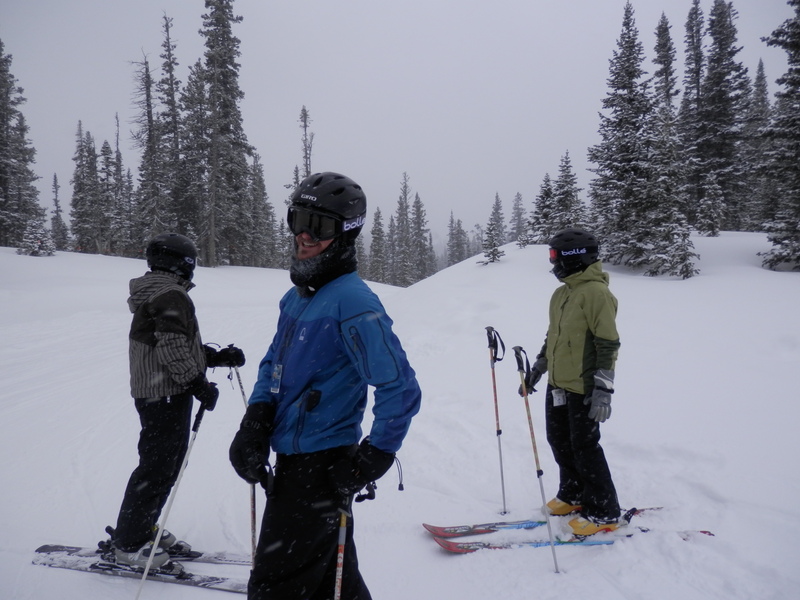 So, today, the boarders were in their element, too. We saw a friend David made on the mountain. 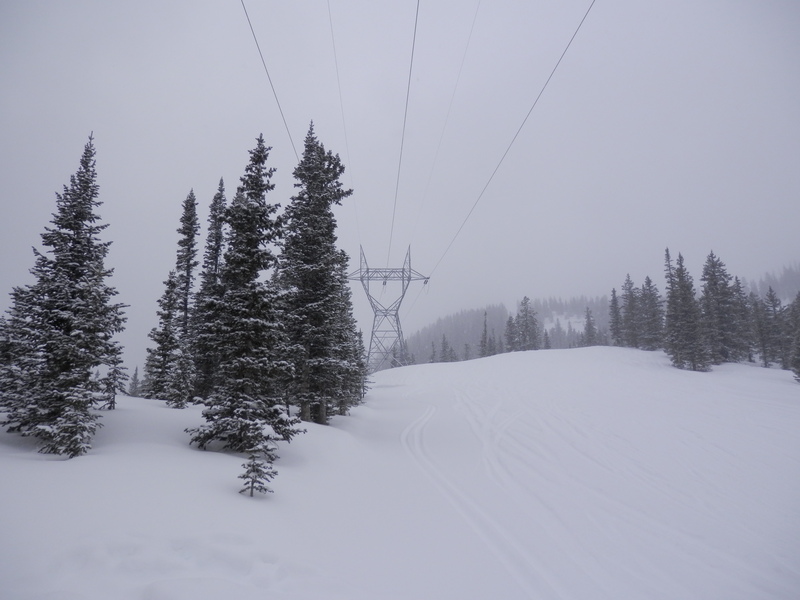 The high-tension power lines that climb up and over Monarch Pass were singing today! If you stop under them, you can hear the snow and wind making them hum quite audibly. I googled it and it seems the snow and wind can cause excess oscillations and “moments” as the power is transferred along the line. Interesting phenomenon, and it sounds pretty cool, but we moved on! 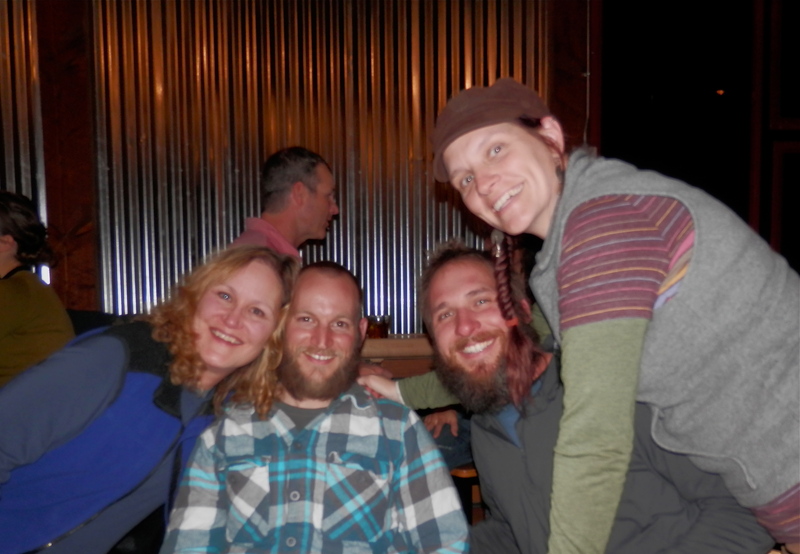 Unusual for us, we went out this evening with some Colorado friends! We’re old and we are tired at the end of the ski day, so we usually go back to the Tramper and entertain ourselves until bedtime. But, Marci and Gabe, our friends from Monroe, LA, and Jeff, our friend from Colorado via Texas, were going out to see a band. 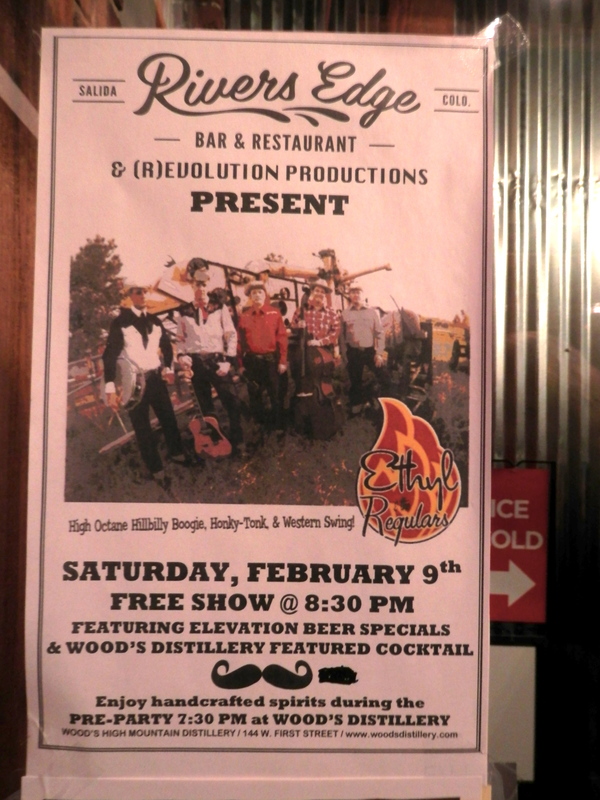 Live music is something we love, so off we drove into the dark snowy night to a Salida bar called River’s Edge. 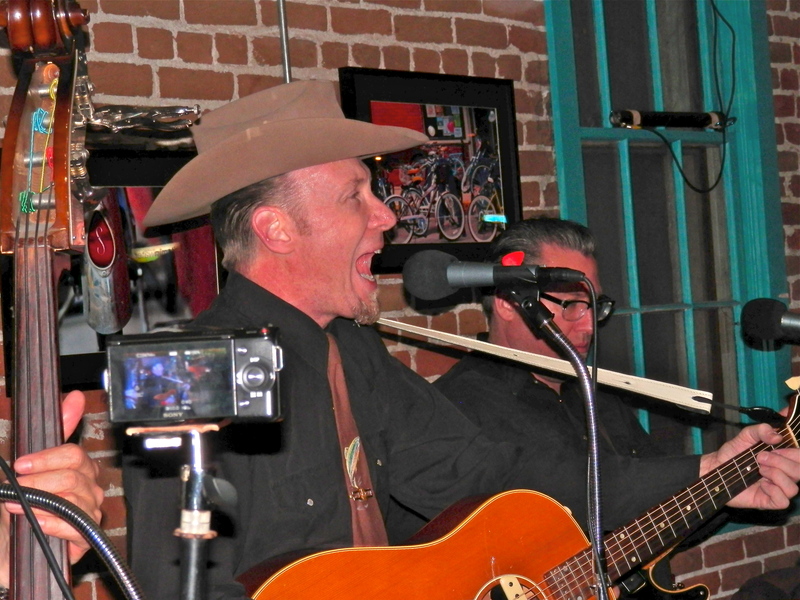 “Ethyl & the Regulars” were playing. 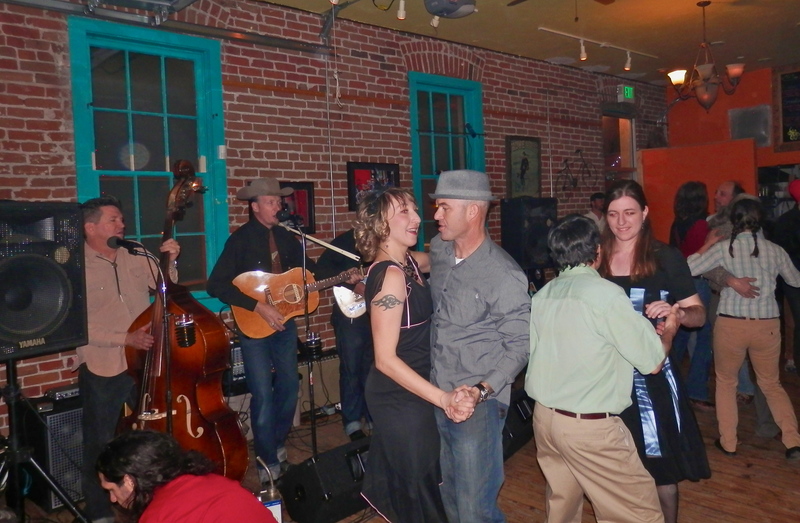 We heard it was to be Swing music. Now, ‘swing music’ to an Easterner is a band with trumpets and trombones and timid guitars. Not so the Western variety! 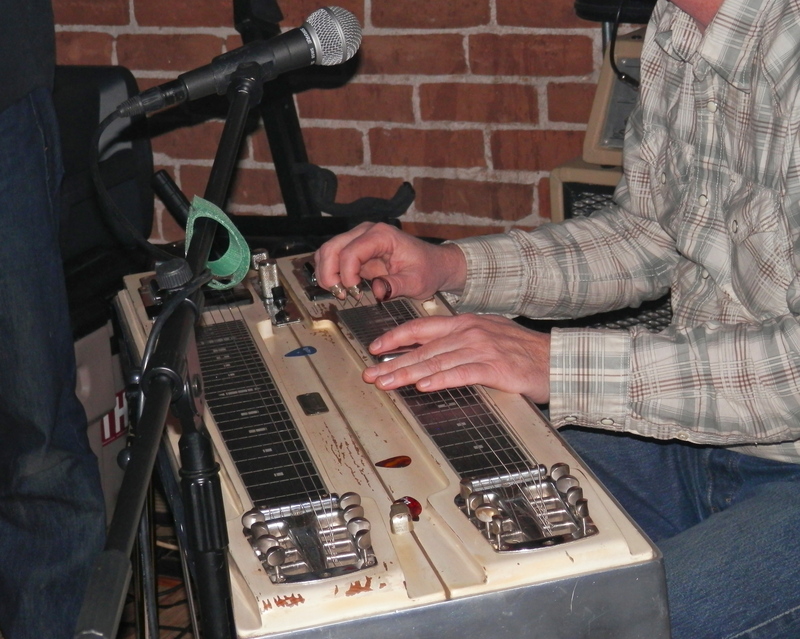 No ‘swing’ band in Baltimore has this pedal steel guitar in it! The didn’t swing, they swang!! We had a blast! But, even over the music, we could hear the mountain calling. We would ski again tomorrow. 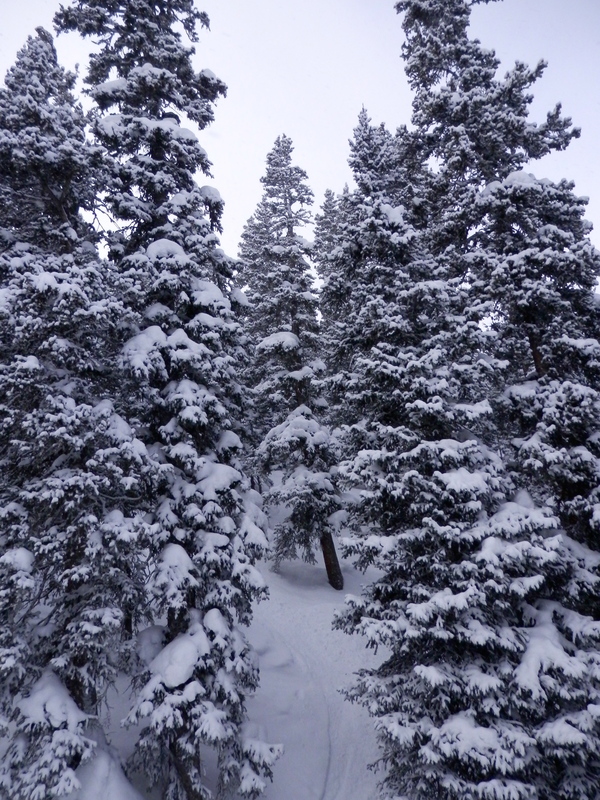 Powder stashes were awaiting fresh turns. So, we left Salida to return to the Tramper. But not before taking in the giant light above the river on Tenderfoot mountain. It might not look like much in the photo, but imagine the dark mountain against the black sky, with a giant letter spelled out in lights. 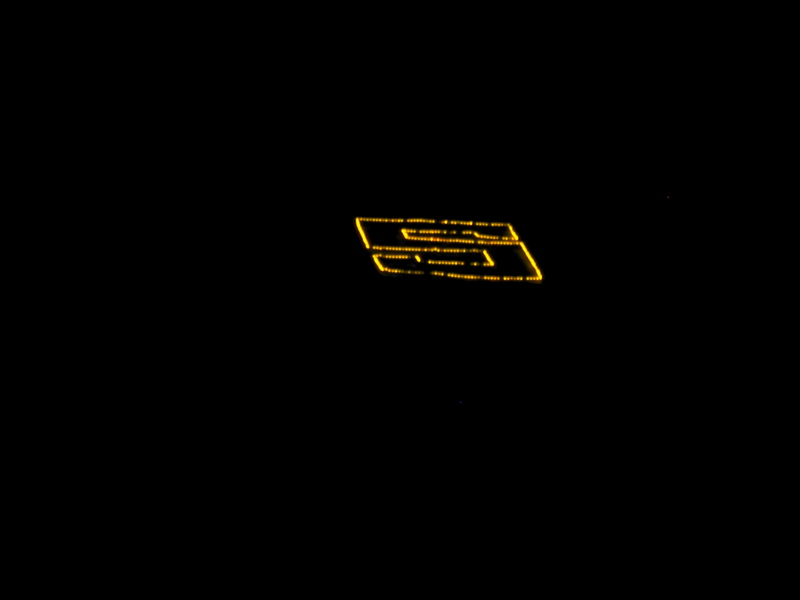 “S” for Salida. 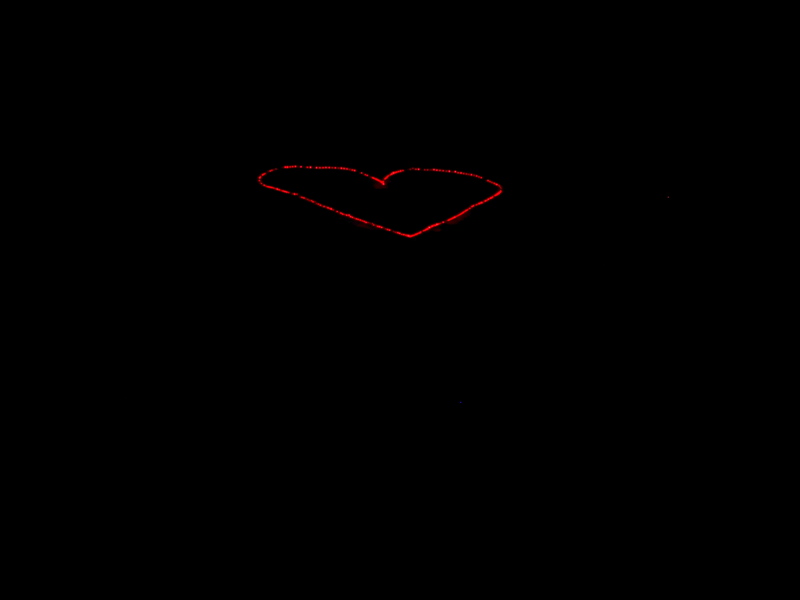 “Big Red Heart” for Heart of the Rockies. 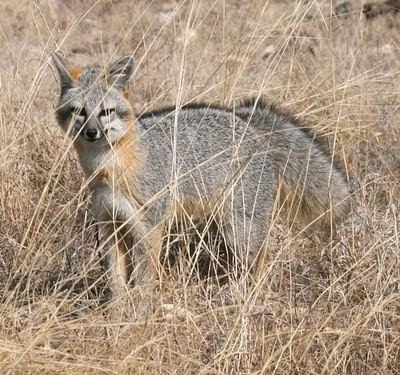 He is much bigger than our red foxes at home in Maryland and his tail and fur were very puffy in the cold. I really wanted to give him some ham, but, of course, that would have been a big no-no! I thanked him for stopping by. DAY 138 – 01/30/2013 – It Fell From the Sky! 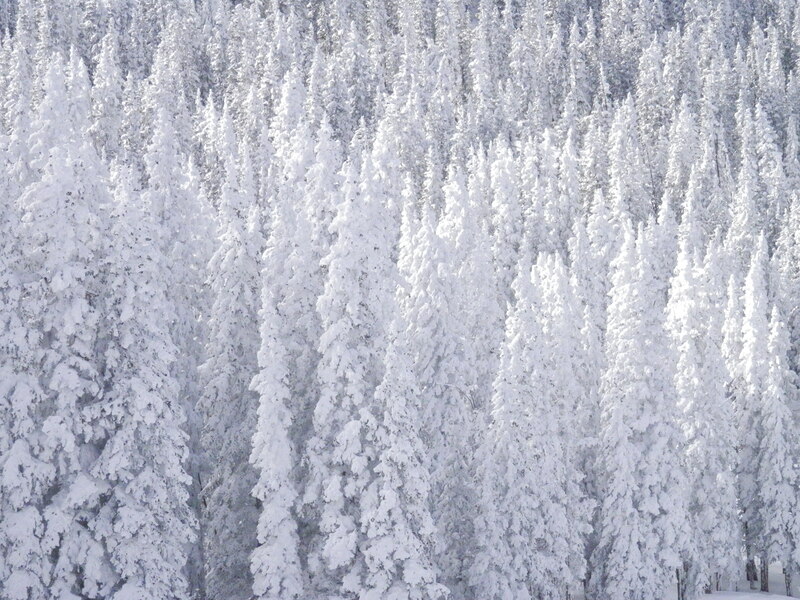 Ponder your Winter. Grey skies, wet sidewalks, dirty cars and cold fingers. Maybe even fumbled car keys in the frigid dark, frozen locks and dead batteries. Imagine the only way moisture came down from above was in that classic Northeast style. Yup, cloudy grey, damp, and near 100% humidity at 31 degrees, then rain. Its freezes on bushes, branches and grass. Pretty sight in small doses, but add the extremes like in Maine and you’ve got downed trees and powerlines across your commute! Yes, if all Winter precipitation were rain and freezing rain, the world would be a different place. But that’s not the only way it falls. It falls as snow! The eskimos have “hundreds” of names for it, (although this is disputed by Wiki). And in Colorado, nearly everyone follows the weather. Commerce depends on snow. Summer cities 200 miles away depend on the gradual delivery from the snowpack. So this week as the snow came again after more than a week without, people were abuzz. Interstate Route 70 West was filling up. Smartphones everywhere ticked the totals at the resorts. People planned their drop ins. 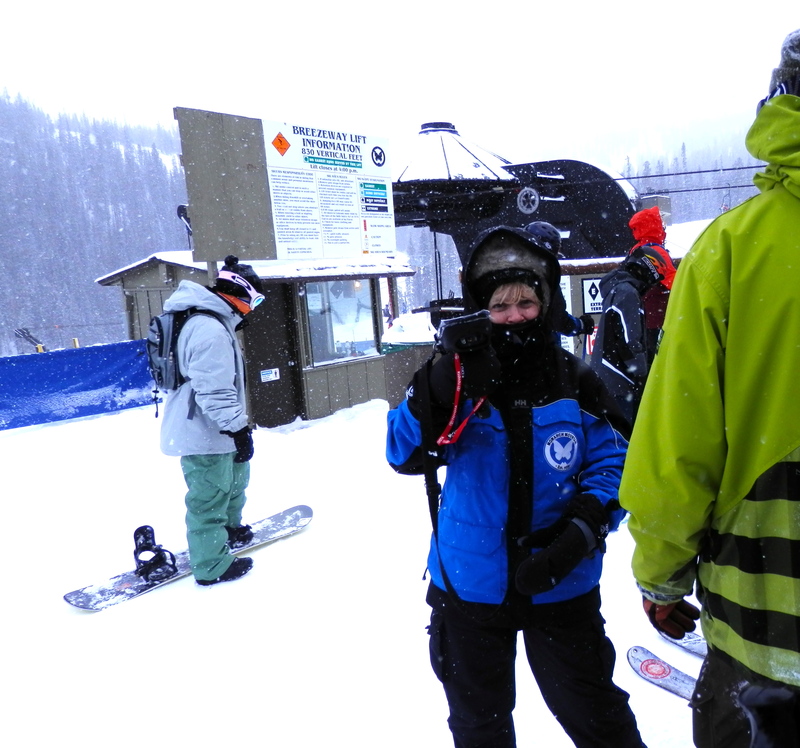 Snowfall ranged from 2-4″ at Cooper, 7-8″ at Beaver Creek, to 29″ down at Silverton. We were fortunate enough to have a standing invitation Wednesday to join a wonderful friend at Beaver Creek to stay in her condo during her vacation. 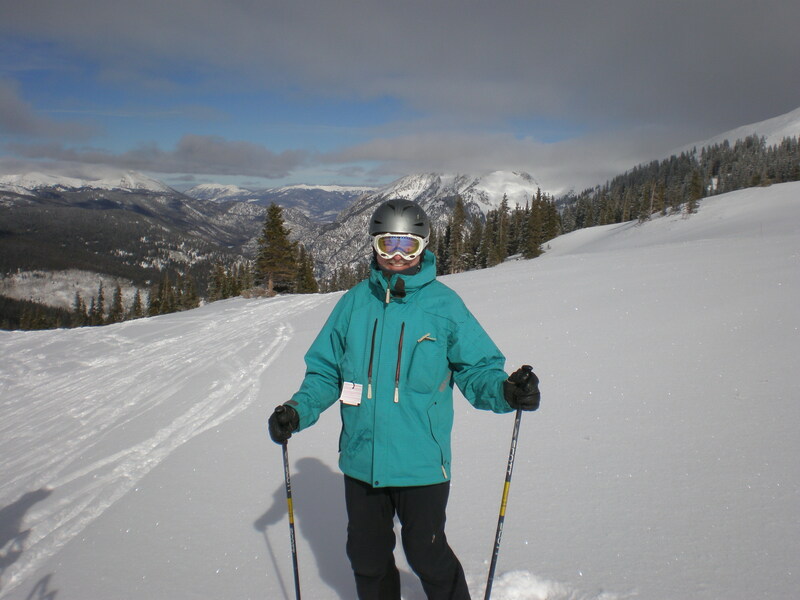 Her brother, some extended family and friend have annual trips to ski there. We, of course typically take vacations like theirs too. But this time we were Trampers, just visiting from the middle of our voyage. A perspective I hadn’t recognized follows us now. 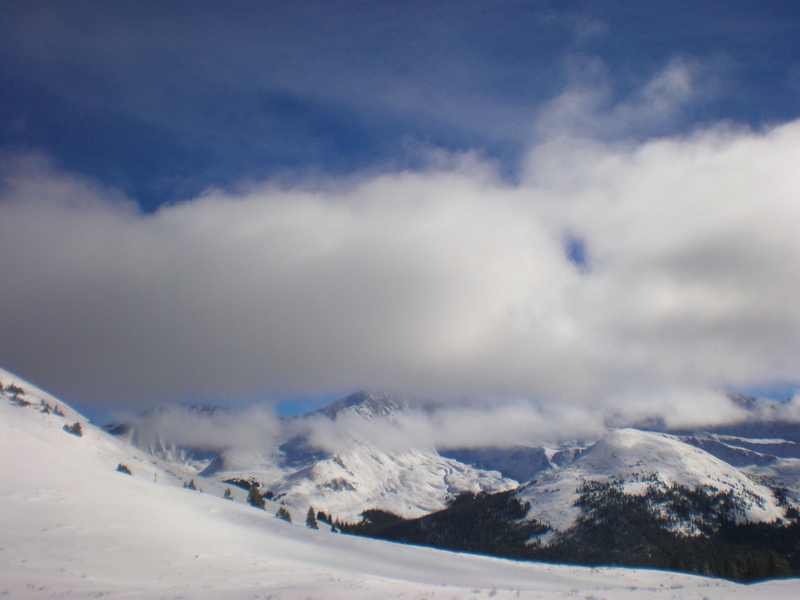 On all my previous ski trips, I lobby for long trips of more than 7 days, wake up for first tracks and close the lifts. On the voyage, I’ve set this mode aside. We wake without alarms, ski a little or a lot. View from Monarch Ridge, top of Panorama lift. Where do we go first? 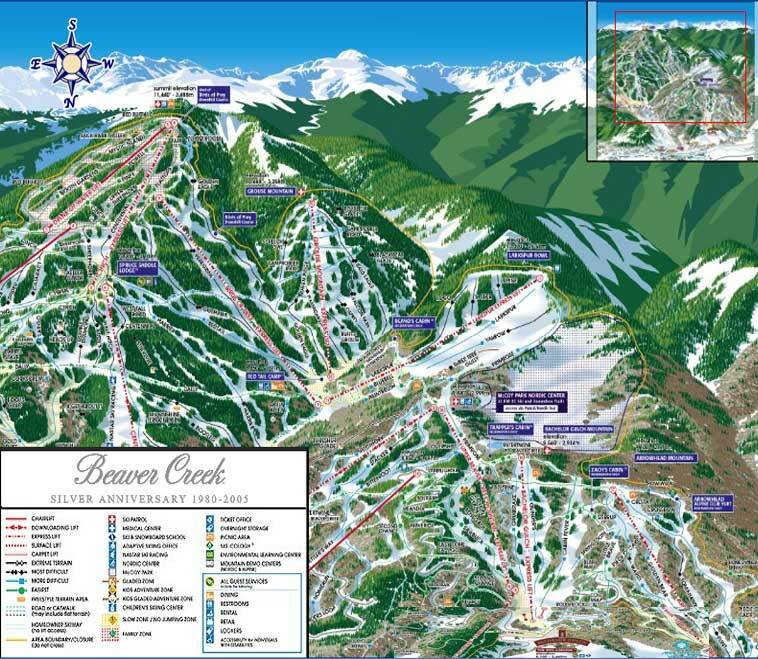 At Beaver Creek, clearly a fabulous and delightfully diverse mountain, the Trampers suffered culture shock. We were amazed traversing the connectors of that big mountain. I was humbled as I stood on the ledge of the Screech Owl Jump along the Birds of Prey men’s Downhill course. Those Olympians are SO, SO amazingly out of my league. We felt as we were skiing in a city, a big bustling city. 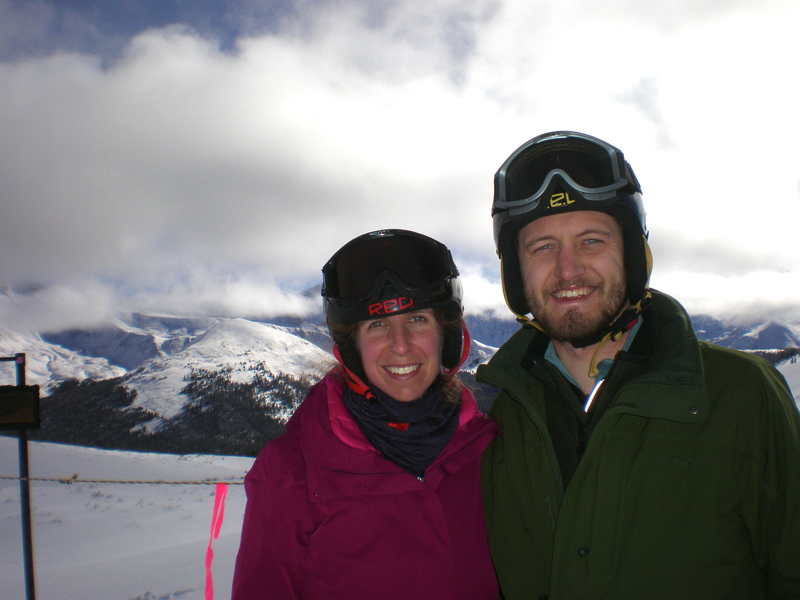 We had fun, but felt our budget could be spared any more days of full-price/big mountain lift tickets. Maybe we can spend that hundred on dogsled rides? 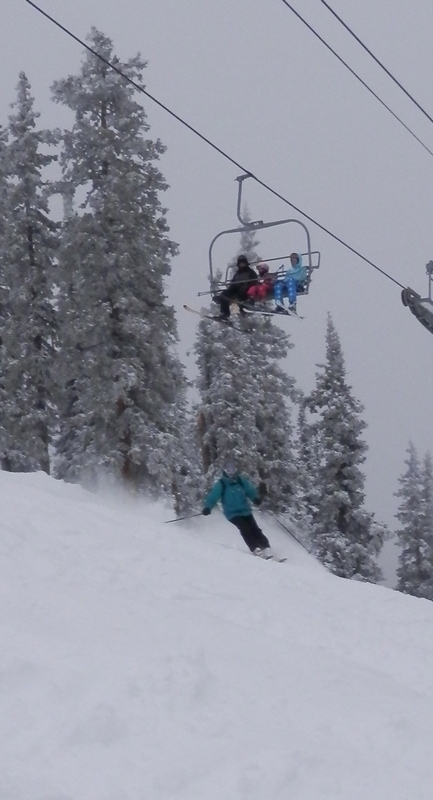 We chose to ski only one day there, then head back to our beloved Monarch where our season pass continues. Most fortunately we loved our visit and hosts. Megan’s family was in the Vacation Mode. You know the one. Each person injects his or her expectations and the clock cannot and will not stop anything from fitting in. Apres ski, hot tub, happy hour, dinners and best of all; wine and cheese in their room. We went by, and thoroughly enjoyed the evening of chat, tasty box wine, yummy cheeses and snacks. The chat is MY favorite. 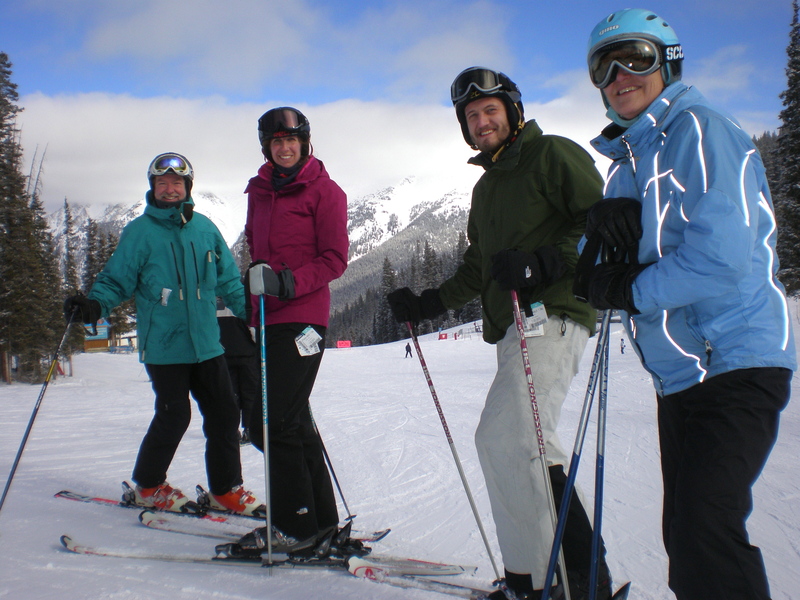 Each of us seemed prompted to share a tale or story of some notoriety, many from or fed by skiing and the lifelong love thereof. Surrounding the fires of memory we shared the oral tradition in all its glory. All of us laughed therapeutically and hard. 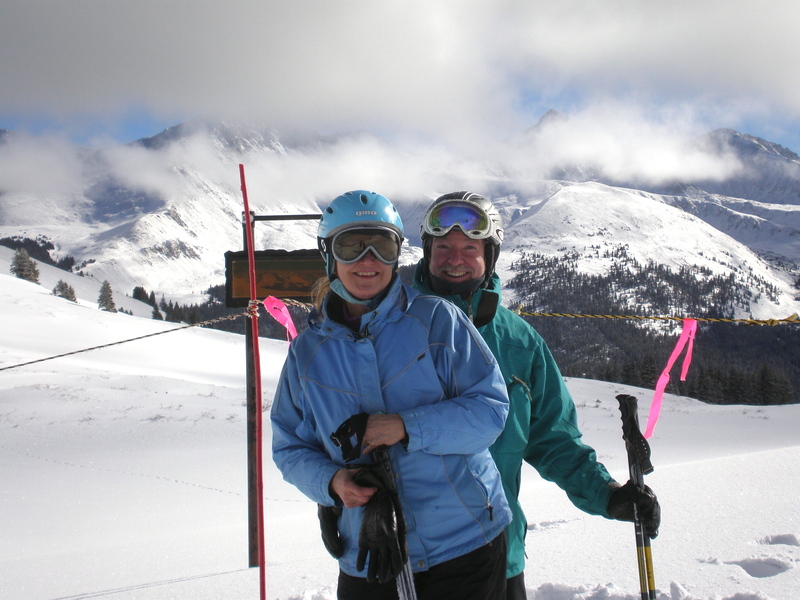 My only regret was that all our searches during the ski day for the leeward relief from wind, the best snow or the best trails to share detoured us from sharing runs with anyone but our more direct host, Megan. Even then, our search blurred some of the blissful runs. 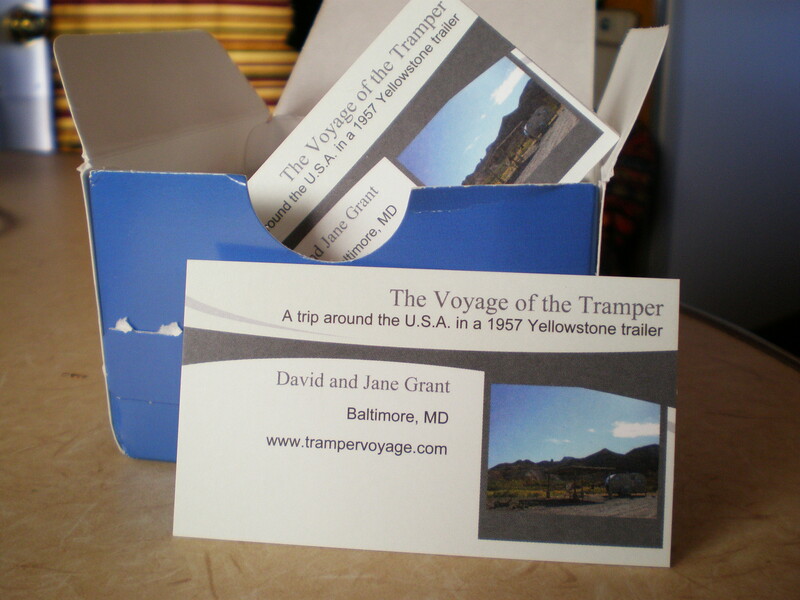 All-in-all, I hadn’t realized how unlike a vacation the Tramper Voyage is. We’ve set an alarm only 2 or 3 times in as many months. Ski for an hour or all day with our cheap picnic squeezed in the sack-lunch area. Skip a day, have a soak, or take a hike instead. And scarcely squeeze anything extra into the days. Even shopping or going 15 miles into town is spontaneous and barely weekly. We sure are enjoying this and hope the picture stays with us to color our future lives, and vacations. An inviting booth where any questions were happily fielded. 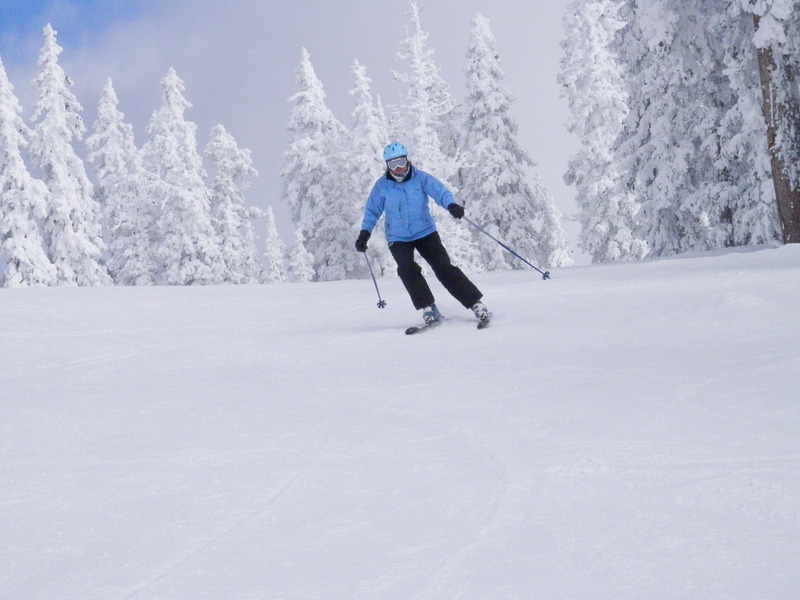 This is not a formal ski test, I am not a tester and skied only three Joyous runs. If this were an actual test, you would have been exposed to similar products from differing manufacturers, blind testing and much more time on the boards. My experience does, however give a bit of feedback and count for a little something. 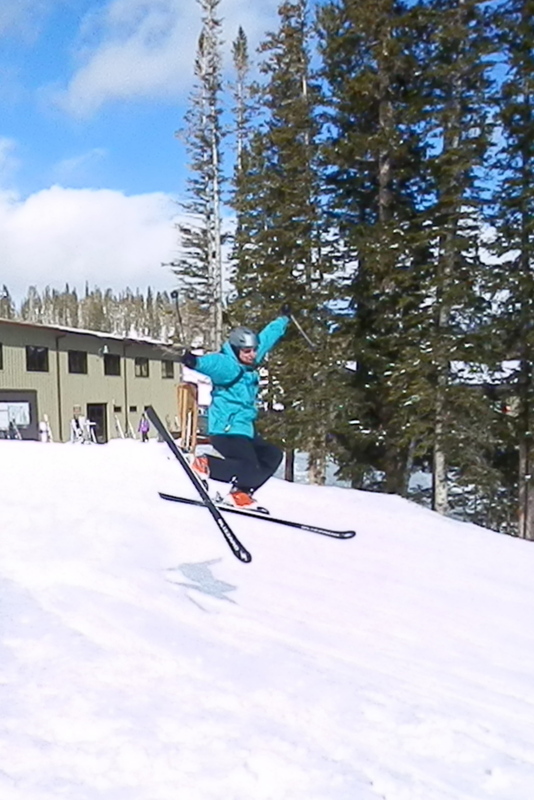 The skis are FUN! They succeeded in providing a big smile during some unpaid fun. Free demo:Free smile! My past several years, and the past 15 days have been spent on traditional construction, cambered Slalom Race Skis. My skis have avery narrow underfoot width and CARVE turns at a rated 13 meter radius. They make small turns with subtle bodily input. 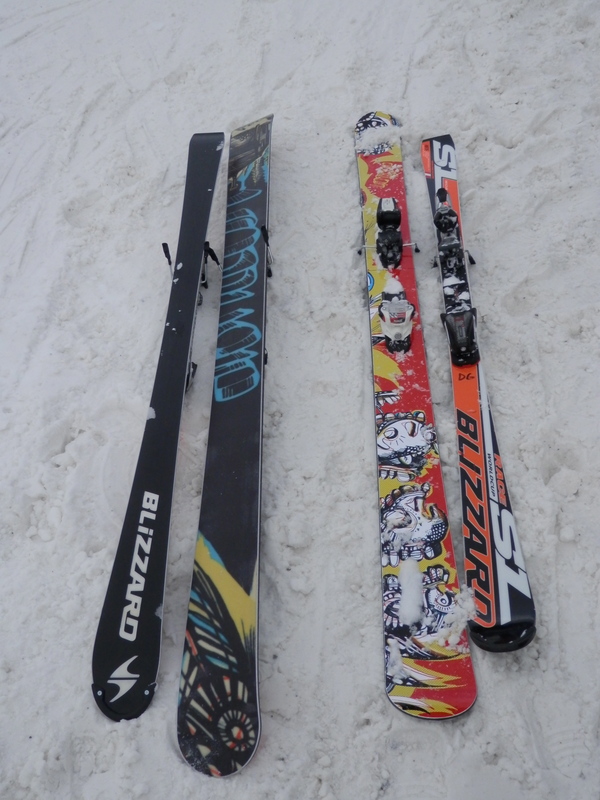 These boards I tried today are wide, full-length powder skis, medium in flex. The closest ski I own is a Nordica Hotrod Hellcat, also traditional camber (no rocker), but of similar width and length. 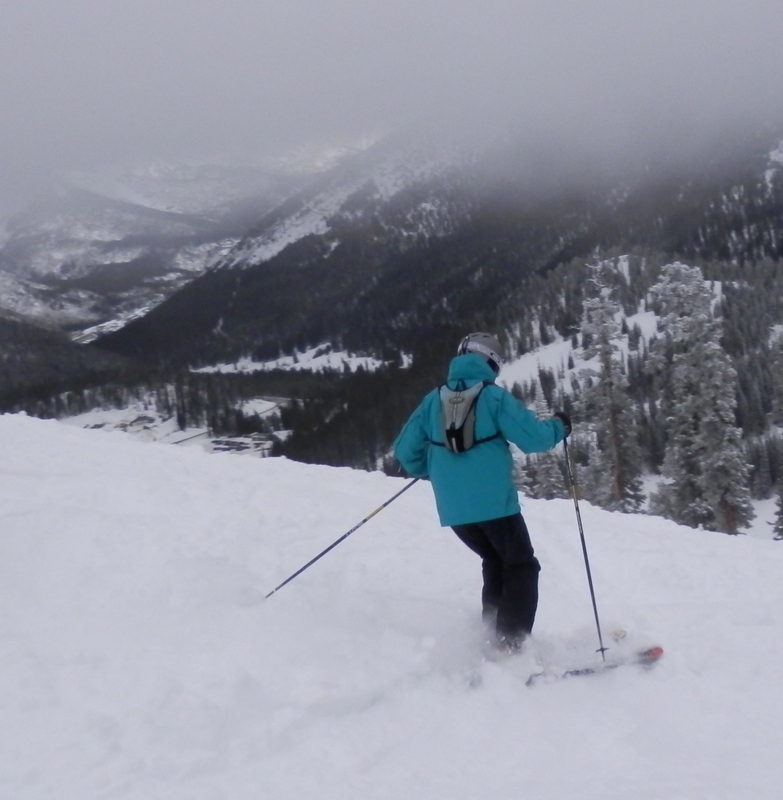 The Albritton is much more comfy in powder than either of my skis. It has a small amount of “rocker” which initiates a turn and helps provide the float. They are not the floppy banana-looking powder boards seen out and about nowadays. They seem a bit more traditional without being old-school. This probably serves to make them a bit more versatile also. 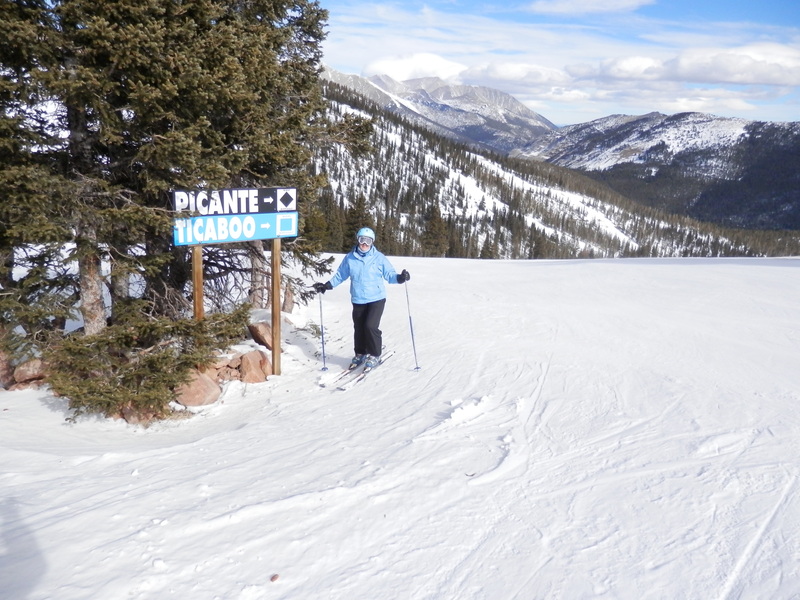 My first few turns required me to move my body parts further to go from edge to edge than my own skis. I had to be patient carving a turn as it felt like a huge radius (by comparison to my own skis I had just stepped out of). On hard snow I felt like I was on a Super-G ski initially…but this came in handy later. Yup, the Albrittons are buttery and supple enough to float through the Pow-pow I found at the edges and in some little tree shots. But, if I let ’em out a little, went fall-line for a bit, BOY were they stable. Stand centered and they happily blasted through the cut up stuff. Fun ski. Too bad I am on the Trampervoyage and can’t add to the quiver right now by buying a pair. Yesterday, in the sack lunch room at Ski Monarch, we met a very nice couple. Their names are Jon and Naomi. They’re from Maine. Naomi & Jon. Married about a year! Isn’t that cute!? We liked Jon and Naomi right from the start. We had that lovely ‘instant rapport’ going on. You know the feeling. When you have things in common that make you feel comfortable right away, but your curiosity is piqued and you want to spend some more time together. 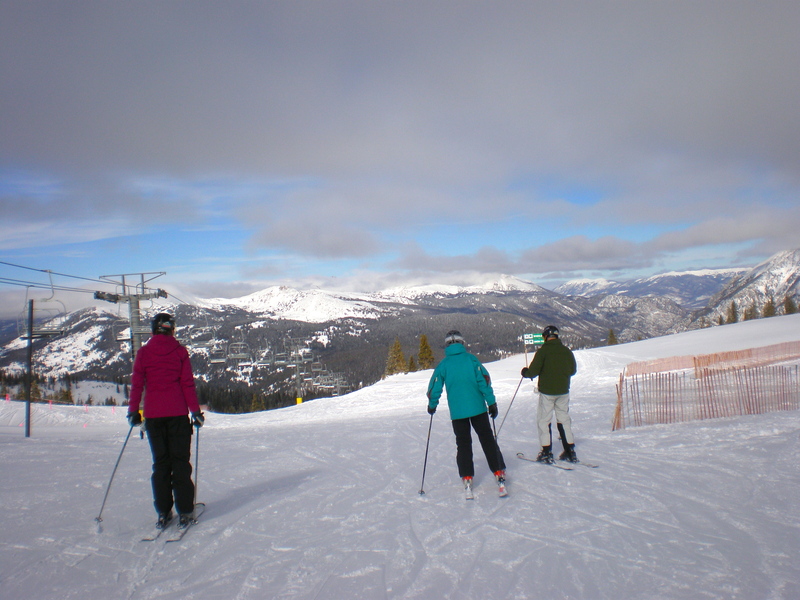 Our new friends mentioned that they were going to try Copper Mountain ski area the next day. While David held his breath in anticipation of revisiting Copper, I asked them if they wanted company. 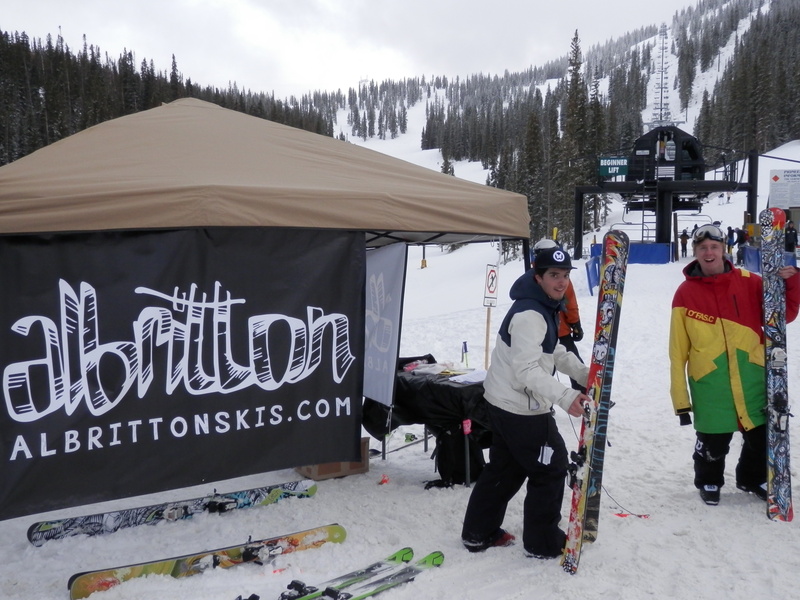 I told them to check out the blog and send us a comment if they had an interest in skiing with us. David said later that he wasn’t going to push for the Copper side trip but he sure was glad that I brought it up. David taught skiing at Copper, back in the ’80’s. Of course, we are loving our ‘home’ mountain, Ski Monarch. 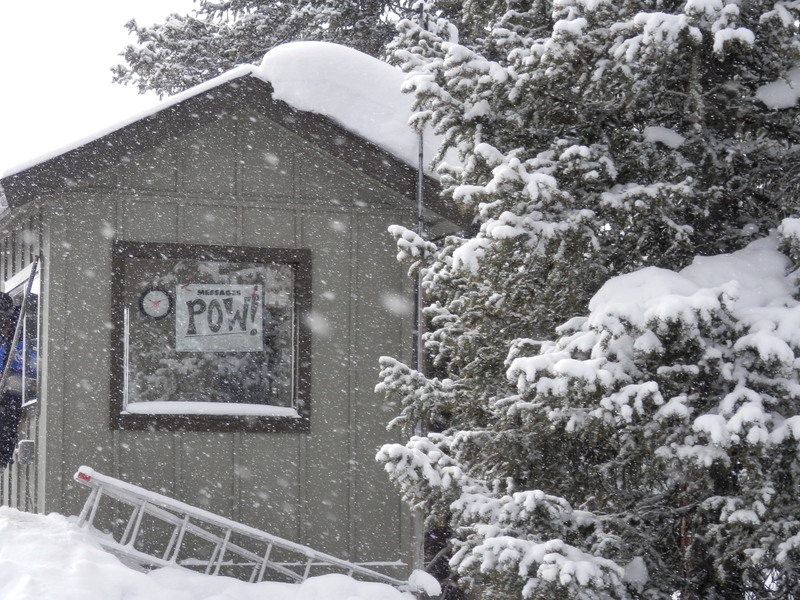 It’s everything we hoped it would be: low-key, inexpensive and close by, with that beautiful Colorado snow and big scenery. 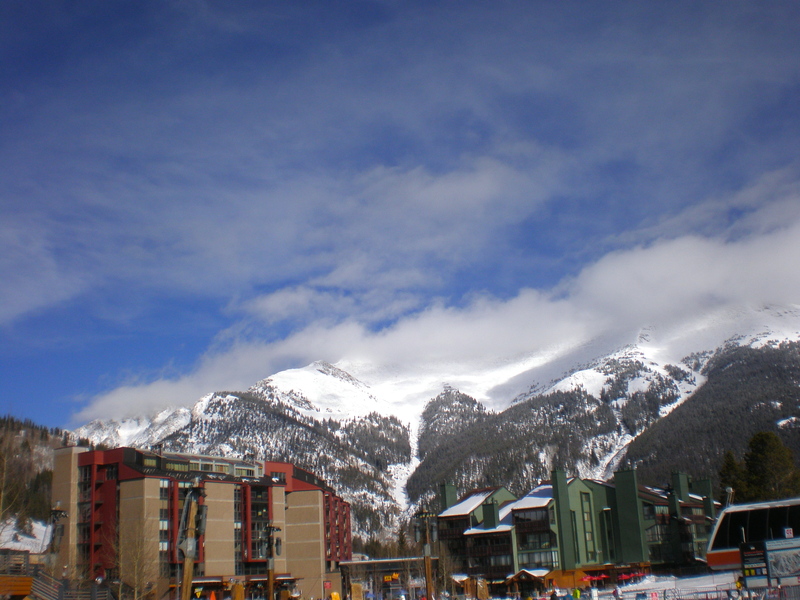 But, Copper Mountain is a different sort of resort from Monarch. It’s huge! Many times more lifts; much more acreage. It’s glamorous. And expensive, so Copper would be a rare treat for us. We heard from Jon and Naomi later in the evening. Yay! We’ll have a fun day at Copper! We packed our ski bags and went to sleep early. Next morning, we met up with our new friends inside one of the Copper Lodges. We quickly realized that exploring the mountain with them would be a good experience! 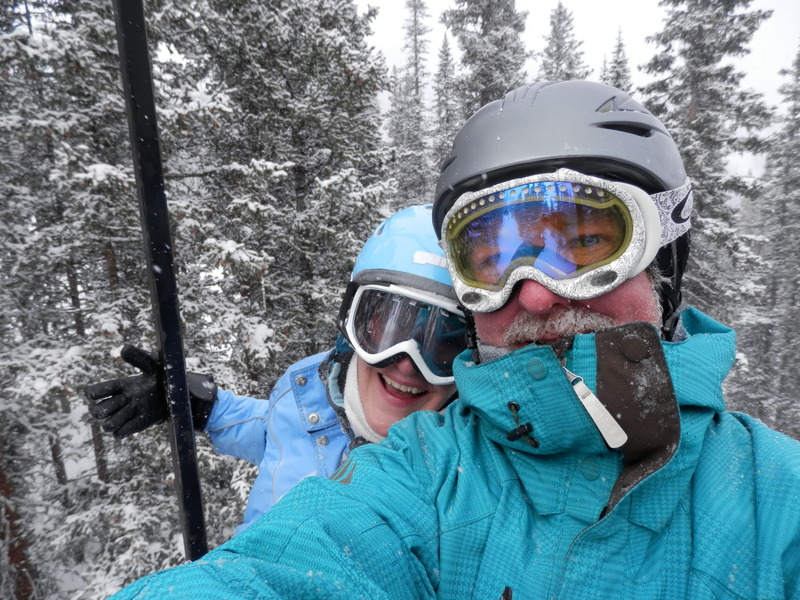 Naomi has been skiing for a while; Jon just started a couple years ago; I am a constantly-learning ski veteran and David is the happiest man on Earth right now! We all skied to our joyful limits. David sprinkled in some really useful tips for everyone and we used those hints, cruising down ‘blue’ runs and testing ourselves on some ‘black diamonds’. We were absolutely done. Spent. But, someone said (as someone inevitably does) “Let’s go down one more time!”. And, so we did, closing down the lift on the very last run up the mountain. Whoo Hoo! We said goodbye to Jon and Naomi and started the long drive back to the Tramper. 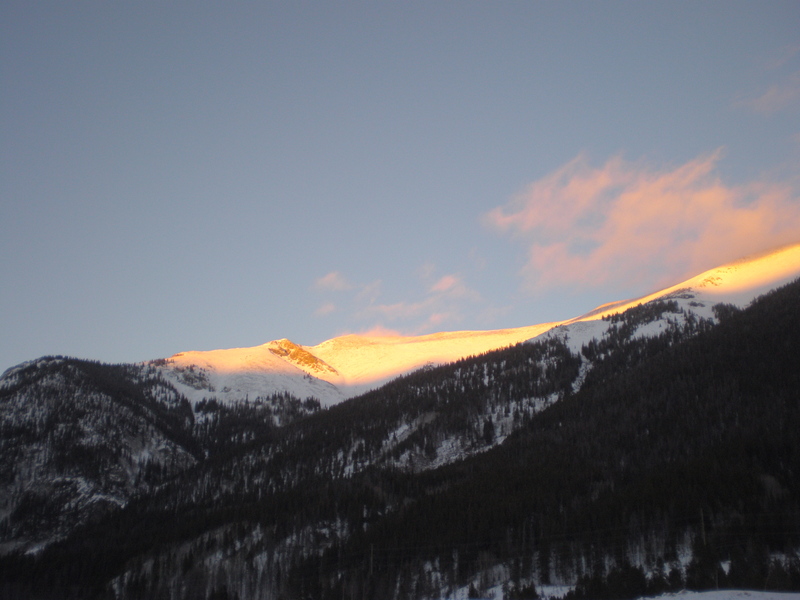 The evening Alpenglow atop the now-slumbering mountains bid us a beautiful goodbye. Gabe leaned his head out the window and said, “Y’all are crazy!“. David and I have heard this before. And we love it! Hearing that phrase means we’re doing something out of the ordinary. Not necessarily something truly insane, which might have terrible consequences, but something a bit daring. Maybe something cool that others might hesitate to try. The day was absolutely frigid on the mountain. After just a couple of runs, you’d have to come inside to warm up. But, you know, I was jones-ing for hot dogs cooked outside over a fire. It’s one of the joys of camping and we are, despite the weather and time of year, still camping. 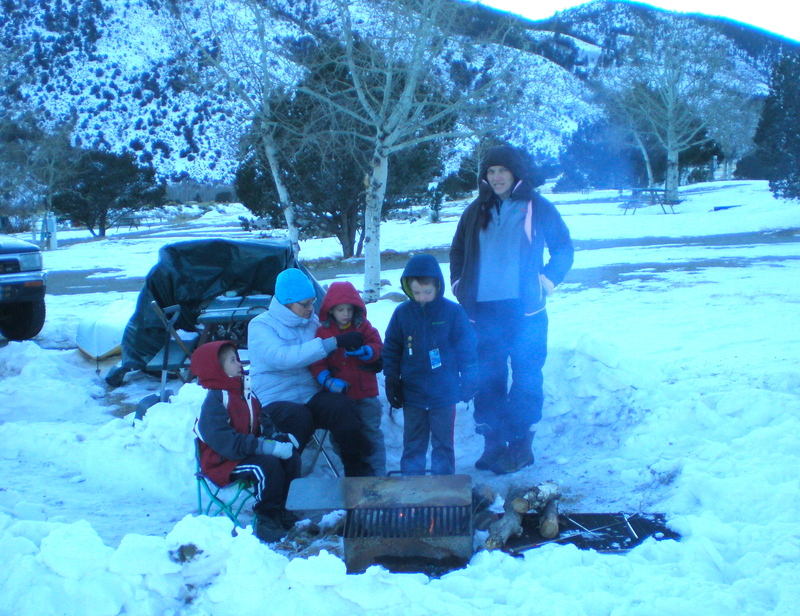 So, when we arrived home at about 4pm, we decided to dig the snow out of our campsite fire pit so that dogs could be cooked. Digging got us nice and warm. It also drew the attention of our wonderful neighbor, Gabe. He and his wife have 4 cute boys. 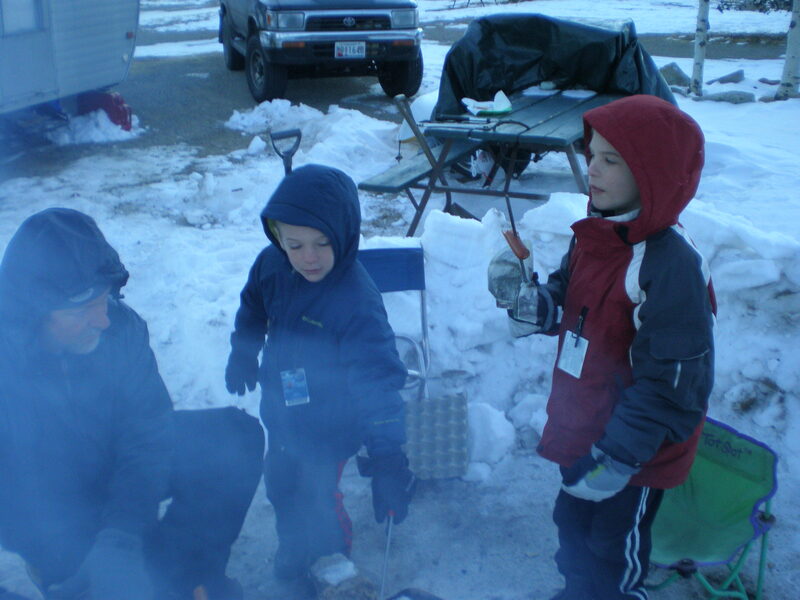 Before Gabe pulled his head back inside the warm motor home, the boys were interested in cooking hot dogs on a fire, too. Has any boy ever not been interested in a campfire? from left, Mark, me, Adin, Asher and Marci, their mom. 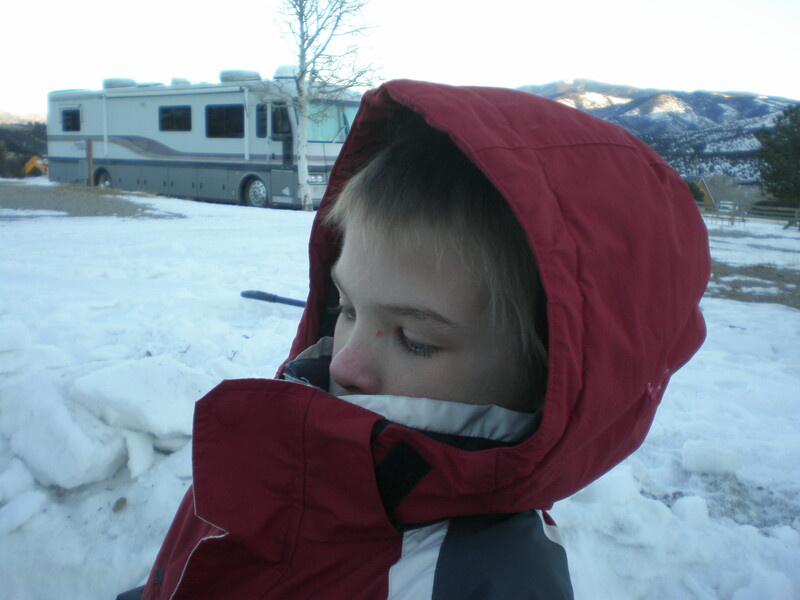 Adin is still very little, so he got cold, cried, and went back inside before he cooked a dog. The two older boys suited up and brought over a couple of logs they had collected. Their mama must have taught them to never go to someone’s house empty-handed! That’s so dear. The Livingston boys are really helping me out. I miss my small friends at home. Back home, there are Charlie, Julia, Katie and Jack across the street. Austin and Emma are a few doors away. I see my godson, Parker, a lot. My step-grandson, Zealen, lives a little farther away now but I see him as often as possible. David calls me the ‘Baby Whisperer’ but, phppbt!, I just like to play. And kids are little, innocent miracles (especially when you can give them back). So, anyhoo, we cooked some dogs on sticks over the fire. Yum! Jane is truly one of the very few adults I know who “GETS” kids. She listens, prompts their input, and doesn’t seem ever to look over their heads and ignore them. I HAVE NEVER SEEN HER ANSWER A PHONE OR TEXT IN A CHILD’S PRESENCE! She is present to the moment she is choosing to share. I never know quite what to say to little ones, I just wait to see what’s on their minds and hope I can add something they care about too. I can’t help but be instructive; ask leading questions and hope to trigger them to solve their own little challenges. I guess that’s whispering too…? An AWESOME Spectacle of ? Where is the Tramper Now? Help the Town That Helped Us!